ILINA, I.-D. , TUDORACHE, T.
This paper deals with the determination of the operation characteristics of a Synchronous Generator (SG) using static experimental tests (current and voltage decay tests). Using these tests the magnetization characteristic, the machine parameters (synchronous magnetization inductances and differential magnetization inductances), the no-load characteristic and the external characteristic were determined. The magnetization characteristic, the parameters and the operational characteristics provide important information about the performance of synchronous generator, machine which is currently used in most power plants. Compared to classical experimental methods with moving rotor and numerical methods of field computation that require the knowledge of geometric dimensions and material properties, static experimental methods are distinguished by several advantages: simple implementation for any type of SG, quick results, low power consumption and no effect on the drive system where the machine is integrated. The mathematical model of SG uses dedicated Matlab-Simulink programs and the results obtained by static methods are compared with those obtained by classical methods. Also to better approach the phenomenon of magnetic saturation and a more accurate estimate of the parameters, the magnetization characteristic, synchronous magnetization inductances and differential magnetization inductances are determined versus the total magnetizing current. E. C. ShaRer, C. A. Gross, "Methods for Determining Linear Synchronous Machine Parameters," in Proc. 26th Southeastern Symposium on System Theory, Athens, 1994, pp. 411-415. M. Kazerooni, N.C. Kar, "Methods for Determining the Parameters and Characteristics of PMSM," in Proc. IEEE Int. Conf. Electric Machines & Drives Conference (IEMDC), Niagara Falls, 2011, pp. 955-960. I. Boldea, "The Electric Generators Handbook - Synchronous Generators", chapter 4, pp. 18-48, chapter 5, pp. 8-39, Taylor & Francis Group CRC Press, 2006. P. Vas, "Parameter Estimation, Condition Monitoring, and Diagnosis of Electrical Machines", pp. 231-245, Oxford Science Publications, 1993. F. P. de Mello, L. N. Hannett, "Determination of Synchronous Machine Electrical Characteristics by Test," IEEE Transactions on Power Apparatus and Systems, vol. PAS-102, no. 12, pp. 3810 - 3815, 1983. A. Tumageanian, A. Keyhani, "Identification of Synchronous Machine Linear Parameters for Standstill Step Voltage Input Data," IEEE Transactions on Energy Conversion, vol. 10, no. 2, pp. 232-240, 1995. J. J. R. Melgoza, G. T. Heydt, A. Keyhani, B. L. Agrawal, "Synchronous machine parameter estimation using the Hartley series," IEEE Transactions on Energy Conversion, vol. 16 , no. 1, pp. 49-54, 2001. B. Stumberger, G. Stumberger, D. Dolinar, A. Hamler, M. Trlep, "Evaluation of Saturation and Cross-Magnetization Effects in Interior Permanent-Magnet Synchronous Motor," IEEE Transaction on Industry Applications, vol. 39, no. 5, pp. 1264-1271, 2003. H. B. Karayaka, A. Keyhani, G. T. Heydt, B. L. Agrawal, "Synchronous generator model identification and parameter estimation from operating data," IEEE Transactions on Energy Conversion, vol. 18, no. 1, pp. 121-126, 2003. R. D. Fard, M. Karrari, O. P. Malik, "Synchronous generator model identification for control application using volterra series", IEEE Transactions on Energy Conversion, vol. 20, no. 4, pp. 852-858, 2005. Y. N. Sarem, J. Poshtan, M. Ghomi, M. Poshtan, "Synchronous generator parameters estimation," in Proc. Intelligent and Advanced Systems (ICIAS), Kuala Lumpur, 2007, pp. 870-875. R. Wamkeue, I. Kamwa, Fellow, "Hybrid-State-Model-Based Time-Domain Identification of Synchronous Machine Parameters from Saturated Load Rejection Test Records," IEEE Transaction on Energy Conversion, vol. 23, no. 1, pp. 68-77, 2008. T. L. Vandoorn, F. M. De Belie, T. J. Vyncke, J. A. Melkebeek, "Generation of Multisinusoidal Test Signals for the Identification of Synchronous-Machine Parameters by Using a Voltage-Source Inverter," IEEE Transactions on Industrial Electronics, vol. 57, no. 1, pp.430-439, 2009. J. Huang, K. A. Corzine, M. Belkhayat, "Online Synchronous Machine Parameter Extraction from Small-Signal Injection Techniques," IEEE Transactions on Energy Conversion, vol. 24, no. 1, pp. 43-51, 2009. G. Valverde, E. Kyriakides, G.T. Heydt, V. Terzija, "Nonlinear Estimation of Synchronous Machine Parameters Using Operating Data," IEEE Transactions on Energy Conversion, vol. 26, no. 3, pp. 831-839, 2011. 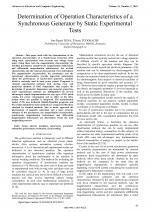 M. A. Arjona, M. Cisneros-González, C. Hernández, "Parameter Estimation of a Synchronous Generator Using a Sine Cardinal Perturbation and Mixed Stochastic-Deterministic Algorithms," IEEE Transactions on Industrial Electronics, vol. 58, no. 2, pp. 486-493, 2011. C. Ramirez, M. Tu Xuan, J.-J. Simond, "Synchronous machines parameters determination using finite elements method," in Proc. International Conference on Electrical Machines (ICEM), Espoo, 2000, pp. 1130-1133. R. Escarela-Perez, E. Campero-Littlewood, T. Niewierowicz, "Efficient finite-element computation of synchronous machine transfer functions," IEEE Transactions on Magnetics, vol. 38, no. 2, pp. 1245-1248, 2002. T. Tudorache, M. Popescu, "Optimal Design Solutions for Permanent Magnet Synchronous Machines," Advances in Electrical and Computer Engineering, vol.11, no.4, pp.77-82, 2011. T. Tudorache, M. Modreanu, "Design Solutions for Reducing the Cogging Torque of PMSM," Advances in Electrical and Computer Engineering, vol.13, no.3, pp.59-64, 2013. L. Livadaru, A. Munteanu, A. Simion, B. Vîrlan, S. Benelghali, "Study on the Fault-Tolerance Concept of the Five-Phase Permanent Magnet Synchronous Generator," Advances in Electrical and Computer Engineering, vol.14, no.2, pp.77-84, 2014. I. D. Ilina, C. Ghita, "Determination of Magnetizing Characteristics of Synchronous Machine by Static Methods," in Proc. 6th International Symposium On Advanced Topics in Electrical Engineering (ATEE), Bucharest, 2008, pp.158-161. P. J. Turner, A. B. J. Reece, D.C. MacDonald, "The DC decay test for determining synchronous machine parameters: measurement and simulation," IEEE Transactions on Energy Conversion, vol. 4, no. 4, pp. 616-623, 1989. V. Z. Groza, "Experimental Determination of Synchronous Machine Reactances from DC Decay at Standstill," IEEE Transactions on Instrumentation and Measurement, vol. 52, no. 1, pp. 158-164, 2003. F. S. Sellschopp, M.A. Arjona, "DC decay test for estimating d-axis synchronous machine parameters: a two-transfer-function approach," IEEE Proceedings - Electric Power Applications, vol. 153, no. 1, pp. 123-128, 2006. L. Vicol, I. A. Viorel, V. Iancu, "Identification of the Synchronous Generator Parameters by Standstill Tests," in Proc. 6-th International Conference on Electromechanical and Power Systems, Chiºinãu, 2007, pp. 138-141. E. S. Boje, J. C. Balda, R.G. Harley, R.C. Beck, "Time-domain identification of synchronous machine parameters from simple standstill tests," IEEE Transactions on Energy Conversion, vol. 5, no. 1, pp. 164-175, 1990. M. Hansi, O. Touhami, R. Ibtiouen, M. Fadel, S. Caux, "Estimation of synchronous machine parameters by standstill test," Mathematics and Computers in Simulation, vol. 81, no. 2, pp. 277-289, 2010. 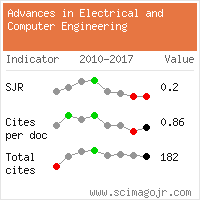 Citations for references updated on 2019-04-22 04:58 in 150 seconds.